Picard Of The Pops: T'Pau | Warped Factor - Words in the Key of Geek. 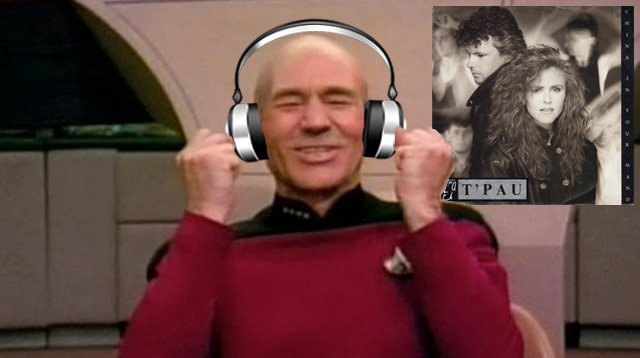 Having previously gone prog with Spock's Beard, Picard's choice of music this week is very much of the Eighties. It was the decade that Carol Decker & band, collectively known as T'Pau, enjoyed several chart hits including China In Your Hand, Valentine & Heart & Soul. They had originally gone under the moniker Talking America on early demos hawked to several record companies, but the name T'Pau ended up being adopted after Decker took the inspiration from a 1986 re-run of The Original Series episode Amok Time, which happened to be playing on a television she was watching while doing some ironing. "I just thought it was a really snappy onomatopoeic word and I ran it by the band." 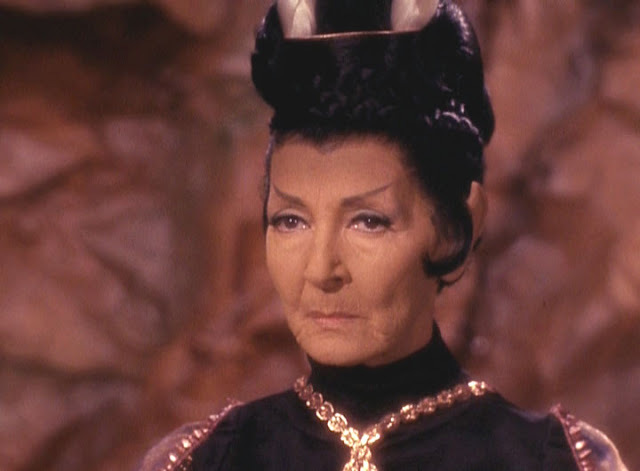 "[T'Pau] was a very dignified, regal, wonderful lady. Celia Lovsky, the actress, played her beautifully. Great stature and importance." The character enjoyed something of a longevity throughout the years of televisual Trek. In The Next Generation two-part episode Unification, the 24th century Vulcan transport T'Pau was named in her honor. A holographic simulation of T'Pau was seen among several historical personality profiles studied by The Doctor in the Voyager episode Darkling, while he was making an attempt to expand his personality subroutines. In the simulation, T'Pau played kal-toh against Socrates as The Doctor conducted his interviews with the other historical figures. Plus, a younger T'Pau would feature in Enterprise, in the episodes The Forge, Awakening & Kir'Shara. T'Pau the group have also had a fairly lengthy career. Although not all of it met with success. Their debut release Heart & Soul initially proved a damp squib in the charts before being used in a Pepe Jeans advert. A surefire way to ensure a second chance as many an artist now knows, the commercialisation of music is not all bad. Following it up with China In Your Hand, which spent five weeks at number one in the UK, was perhaps even smarter! Their debut album Bridge Of Spies occupied similarly lofty heights, the difficult second album coming to pass with Rage by 1988, two albums in two years possibly proving too much. After the release of The Promise they would split, entirely logically in cold non-melodic Vulcan terms you may think! Decker reformed the band with a new line-up in 1998, T'Pau: The Next Generation it could be said! A new studio album titled Red followed. The record was not a commercial success, but the group continued to perform live on a semi-regular basis for the best part of a decade after that. A resurgence as a duo of Decker & original T'Pau guitarist Ronnie Rogers came in 2013 as they toured to mark the 25th anniversary of the formation of the band, two years hence the album Pleasure & Pain emerging. "It's a little harder to get on the radio because all the '80s stations play the '80s stuff and they won't play your new stuff. They actually say they can't, and then the younger stations play the younger artists, the hip stations. That's the downside, and I miss hearing radio plays for the new stuff... it is a little frustrating that I can't get it out to the wider audience anymore." "...liked the sound of the word."